High quality, well-crafted knives make an enormous difference in food preparation and presentation, so it pays to invest in a handsome and highly functional knife set. The TigerChef 10-Piece Stainless Steel Knife Block Set is just that, a terrific purchase for the professional or home chef. Whether you want to upgrade your current knife collection or provide your kitchen staff with the finest in kitchen tools, this knife block set has everything you need. 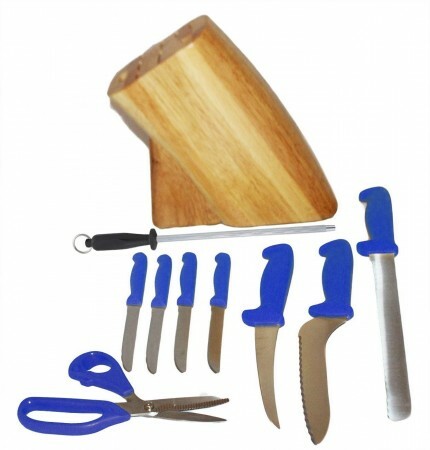 NSF listed and professional grade, this set includes the following kitchen knives and tools: (1) take-a-part kitchen shears, (4) utility knives, (1) boning knife, (1) sandwich knife, (1) slicing knife and (1) sharpening steel. It also includes a 9-slot solid wood knife block for safely storing the knives and tools. A must-have in any kitchen, these knives are perfect for slicing, chopping, filleting, peeling and more. Each knife from this set is built with a high carbon stainless steel blade designed to meet the demands of professional kitchens. Made from the highest quality steel, each blade provides unparalleled performance. The strength and hardness of each blade delivers excellent edge retention which means less time required for maintenance. These corrosion-resistant high carbon stainless steel blades are extremely sharp and offer excellent cutting precision and, despite their hardness, they can be easily sharpened with sharpening steel. Thanks to this wide selection of knives, you can be assured that you will have the proper knife on hand for any task in your commercial kitchen. This knife block set includes a 6-inch curved semi-stiff boning knife perfect for trimming, removing skin and portioning cuts of meat, fish, and poultry. Boasting a razor-sharp curved edge, this boning knife effortlessly follows the natural curve of meat allowing it to cut through tendons, fat, and bones. Additionally, this knife block set comes with a 10-inch serrated edge slicing knife with a rounded, blunt tip perfect for quickly and conveniently cutting through tough bread and meat. Another indispensable knife included in this set is the 9-inch offset serrated edge sandwich knife which easily cuts through thick bread crusts without damaging the integrity of the loaf. Boasting an offset design, this knife keeps your knuckles from hitting the surface. Lastly, this knife set also includes (4) 4-1/2 inch utility knives perfect for peeling and slicing fruit and vegetables, or for carving small meats, making it ideal for all your food prep needs. As an added bonus, this stainless steel knife block set includes take-a-part kitchen shears which allow you to work quickly and efficiently when cutting apart a chicken, snipping herbs or shredding leafy greens and vegetables. These extra-sharp shears can also easily cut through thick skin, scales, and fins making them a must-have in any seafood restaurant, deli, or market. Designed with a wide grip, these shears won't slip as you cut, making them a valuable part of your kitchen arsenal. Designed for easy use, each knife is designed with an ergonomic non-slip handle that fits comfortably in the user’s hand while minimizing wrist tension. The comfortable handles also ease the stress on the user’s hand while performing repetitive chopping, cutting, and slicing tasks. Available with red, blue, green, and yellow colored handles, you can designate a different knife block set for a specific food category or cooking purpose to prevent cross-contamination. .
Keep each of these knives easily accessible and organized on your kitchen counter with the 9-slot solid wood knife block included with this set. This knife block provides convenient storage, protects you from accidental nicks and cuts, and keeps each knife in pristine condition. Designed with a slanted body, this knife block maximizes counter space while ensuring easy access. Thanks to its sturdy base, this knife block ensures that the knives stay secure for added safety. All high quality knives require proper maintenance to keep them in perfect condition. Easily hone the edges of each blade to their optimal sharpness with the sharpening steel included in this knife block set. This oval sharpening steel combines the rigid construction of high carbon stainless steel and an easy grip handle to make sharpening your knives comfortable and safe. This sharpening steel will keep the blades, especially straight-edge knives, in top working condition ready to complete any cutting task at hand. Thanks to the eye-hook at the tip of its handle, this sharpening steel allows for convenient hanging and storage. For proper care and maintenance, it is recommended to hand wash each knife immediately after use. Do not wash in the dishwasher as the harsh chemicals and hot temperatures will damage the quality of the blade. After hand washing, dry each knife thoroughly using a paper towel. Always keep in mind that even the most durable and high quality knives have limitations and are not indestructible. Proper care and maintenance is necessary to keep them in top working condition. Enjoy the beauty, quality and craftsmanship of the TigerChef stainless steel knife block set. An excellent choice for both discerning home cooks as well as culinary professionals, this 10-piece knife set is a worthwhile investment for any restaurant, hotel, or home kitchen.